Try something special with these deliciously exciting taste sensations. 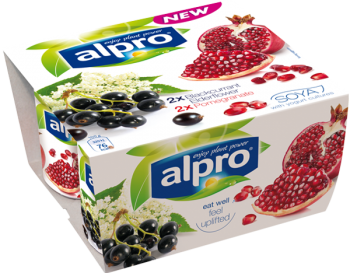 Two delicious pots each of luscious blackcurrant with fragrant elderflower, or exotic pomegranate, both blended with our silky, plant-based variation to yogurt. Either flavour will add a touch of sophistication to your day, wherever and whenever you dip in. Contains soya. May contain traces of almonds and hazelnuts. Naturally lactose free & dairy free. Gluten free.